Attention Dog Lovers! It's time for Weekend Dog Blogging #20! To see more fun dog photos and discover yummy new food blogs, you can usually head over to Sweetnicks on Sunday night for the complete roundup. But this weekend Sweetnicks is out of town, so Alicat has graciously taken over WDB duties. Please visit her at Something So Clever for the Sunday night roundup. Hey there Farmgirl! Just a note to let you know Sweetnicks is out of town and I am actually having the round up at my place this Sunday. Everyone can email me at somethingsoclever01@gmail.com :o) Thanks! That's hilarious! If the sheep could laugh, that's what they'd be doing! Looks like he entertains them too! who is laughing? me or those sheep. this is just sooo great. By they way who taught him the tricks? I snuck into the computer room after a sleepy weepy afternoon with my 22 month old son to see what you had posted. Yep, Blogger was in rare form on Saturday -- but gratefully all seems to be well now. Have a great evening and look forward to new photo experiences throughout the week. That looks exactly like the circle of onlookers that always forms around a breakdancer. Awesome. i love your photos, farm girl. yup, i'm with kat on this one; that kind of happy rolling can mean only one thing: poop perfume for doggies! Thanks so much for the heads up. Once again I was out of the loop. Oops. Have the post changed now. And thanks for guest hosting WDB! I think everybody is laughing. I know I was. Who taught him the tricks? Nobody! Bear came with the Super Deluxe Set Of Instincts. You wouldn't believe how long his job description is. You do know he gardens as well, right? 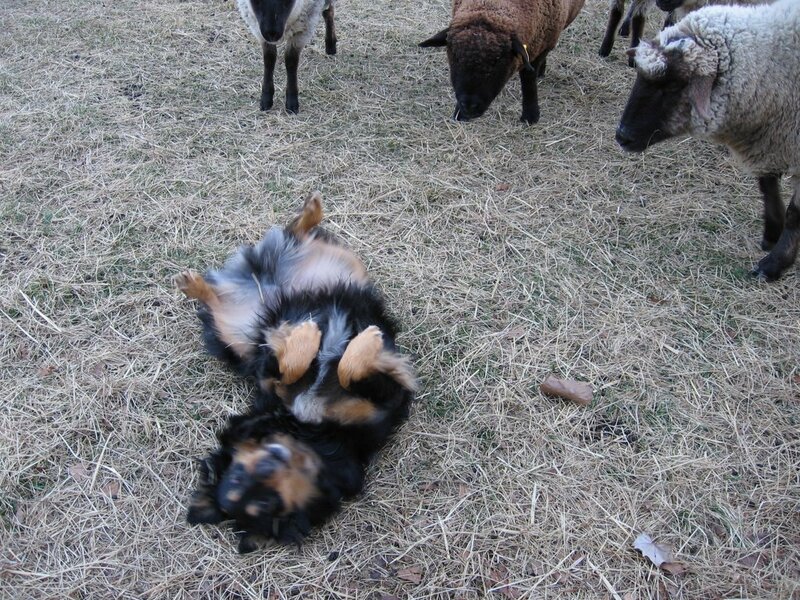 I'm left wondering if your dog break dances, or if he rolls over and the sheep actually come and rub his tummy. LOL! that is one great dog and great phot! Thanks Farmgirl!